Over eight years ago, Rick Hodges of Northern Virginia, the parent of a child with Down syndrome, had the idea to attempt to pass legislation that would allow those with Down syndrome to live with a much more secure sense of financial stability. Hodges drafted the first version of the act in 2006. Shortly thereafter, Steve Beck, also the father of a daughter with Down syndrome, became the driving force towards the passage of the Achieving a Better Life Experience (ABLE) Act. As described in the Washington Post article, Mr. Beck and his daughter, Natalie, were as close as close can be, and he strove to make a difference for her and the Down syndrome community. Essentially, the act allows those with disabilities to have financial options similar to those without disabilities. As also explained by the Boston Globe, those with disabilities did not nearly have the same financial ability to save money for their futures. Many in this day and age might not even consider the repercussions of the limits disabled people have financially, but Mr. Beck and Mr. Hodges did; and they wanted to change this status quo. For years, my family has closely monitored the progress of the bill because my uncle has Down syndrome. However, we were not fully aware that those writing and fighting for the passage of the bill lived just a short distance from us. In December, when my mom showed me the article in the Washington Post, I made a connection I simply hadn’t up until that point. I recognized the picture of Natalie and her family, and realized the Natalie Beck in the picture was the same one that is currently an Options student at my school. Mr. Beck worked for years to pass the bill through the gauntlet that is called Congress, and he saw all his hard work pay off on December 3rd, 2014, when the bill passed in the House of Representatives. Then, unexpectedly, five days later, Mr. Beck passed away, less than two weeks before the bill passed in the Senate and was signed into law by President Obama. Mr. Beck’s name was later honorarily added to the bill. The school community was deeply saddened by the loss of Natalie’s father, and one student in particular wanted to do something for Natalie. Josh Holmes, a member of the Class of 2016, thought about what he could do for her. A member of the cheerleading team, Natalie loved donning her uniform and pumping up the crowd after her somersaults. Josh took to Twitter to contact a member of the Washington Wizards’ cheerleaders to see if they could do anything for Natalie. Originally, Josh hoped some members could come to a basketball game and perform with Natalie, but with snow days and some logistical issues, that wasn’t able to happen. Derric Whittfield, the coach of the Wizards’ cheerleaders, received an email from Josh explaining the situation and asking if there was anything the Wizards could do for Natalie. Coach Whittfield was more than happy to help, and he sent a package of gifts to be given to Natalie. 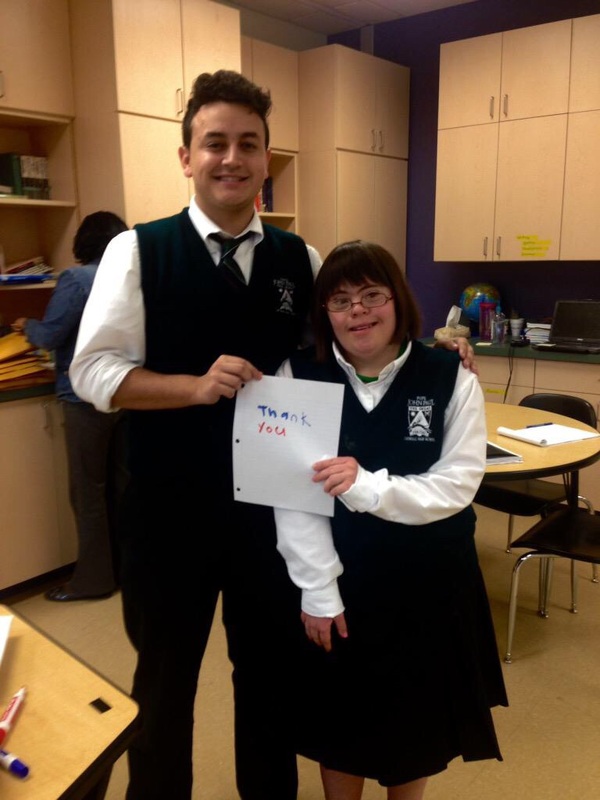 Josh received the package and presented the gifts to Natalie after the all-school Mass last Wednesday. Included were fun gifts such as sunglasses, along with a team picture of the Wizards’ cheerleaders autographed by the whole team, and two tickets to an upcoming Wizards game. In attendance at Mass was Natalie’s mom, Catherine, who was overwhelmed by the love and support by the John Paul community after what had happened. “Natalie was so happy to receive this gift. She loves cheerleading along with her awesome squad at Saint John Paul the Great. Josh’s presentation brought me to tears. We are so honored to have a daughter who is a student as Saint John Paul the Great. And what happened here today at Saint John Paul the Great is one of the reasons why. Josh Holmes went to great lengths to do something extra special for a fellow student. He chose to use his time to help someone who had a need. Josh, just a student, used his expertise in Twitter and his love for basketball, he shared his gifts with another. This is the same theme that Mr. Beck followed when working for eight years on the ABLE Act. Mr. Beck, just a Dad, took advantage of his proximity to Washington D.C. and his love for politics, he shared his gifts with another. Here are two great examples of how two ordinary people shared their time and talents and accomplished extraordinary things for the benefit of another. Pass it on!” she said. Also noted in the Boston Globe article is the amount of bi-partisan agreement, rarely seen on Capitol Hill, that occurred in the passage of this bill. Many members of Congress were personally affected by the ABLE Act, with children of their own having Down syndrome. “This was a rare case, said Crenshaw, of ‘Democrats and Republicans, the House and Senate, all coming together.’ As far as its origins, Crenshaw paraphrases Ronald Reagan: ‘There’s no limit with what you can accomplish, as long as you don’t care about who gets the credit,'” Joan Vennochi wrote. Josh would also like to thank Coach Whittfield and the entire team of Washington Wizards’ cheerleaders for what they did for Natalie. It is these kinds of acts of goodness that show us what a good place this world really is. With many issues and situations affecting nearly everyone in some sort of way, it is important to shine a light on the positive ones. This type of generosity is what restores hope to many. Included below is the YouTube video of the presentation. Thank you Josh, for making a difference. And thank you, Natalie, as well as the whole Beck family, for affecting change on the world, one step at a time. This entry was posted in Home and tagged ABLE Act, Achieving a Better Life Experience Act, Boston Globe, Catherine Beck, Cheerleaders, Congress, Democrats, Derric Whittfield, Down syndrome, House of Representatives, Josh Holmes, Mass, Natalie Beck, Options Program, President Obama, Republicans, Rick Hodges, Ronald Reagan, Saint John Paul the Great Catholic High School, Senate, Steve Beck, Twitter, Washington Post, Washington Wizards, Washington Wizards Cheerleaders, YouTube. Bookmark the permalink.